Last month, Ozeri sent me one of their Stone Earth Pans. Made with natural stone-derived coating, the pan is thick, non-stick and easy to clean as well. We have an electric hob at home and the pan offers excellent cooking performance on that. It heats up evenly, requires considerably less oil than standard cooking pans and food does not stick to the pan allowing efficient cooking. 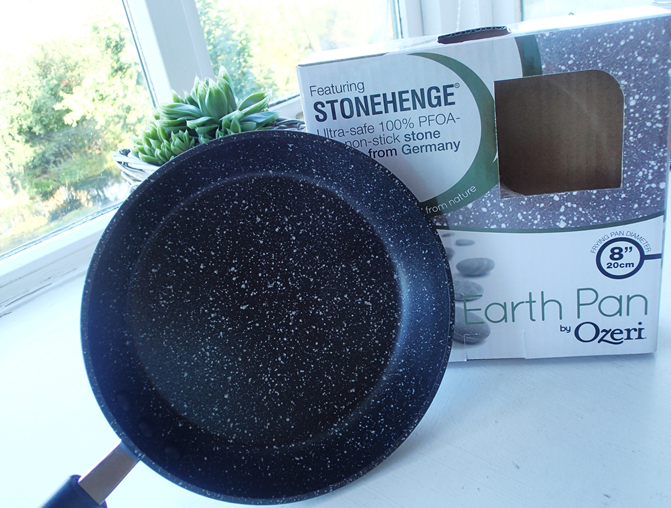 The Stone Earth pan makes use of a stone-derived coating from Germany that offers non-stick perfection while remaining 100% free of PFOA (which is a harmful chemical often found in traditional non-stick cookware). The inside of the pan is made from durable heavy-gauge die-cast aluminium and is more durable and scratch-resistant than most other non-stick surfaces. The pan boasts of a heat-resistant silicon coated handle that is very comfortable to hold. The pan that I have is 8 inches in size and is the perfect size for breakfast and light meal preparation. I have been using it for sautéing, frying and even braising and with its non-stick properties, the Stone Earth Pan has delivered in all instances. Dishwashing the pan is not recommended but I am okay with that. Hand washing the pan is easy and if used as directed then the pan is very easy to clean. You need to allow the pan to cool before cleaning and also ensure that you do not use harsh detergents and/or abrasive scourers. chemicals, is truly 'non-stick' and easy to clean, then the Stone Earth Pan by Ozeri is a good option. You can purchase the 8 inch pan for £19.99 from Amazon. It is an excellent and totally non-stick pan. Highly recommended!